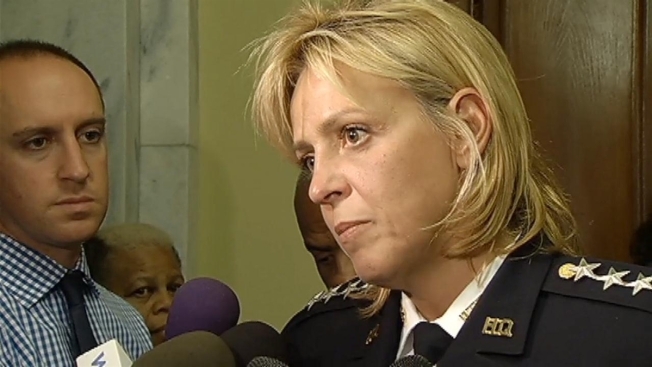 D.C. Police Chief Cathy Lanier said Monday that her department gets more complaints about officers conducting traffic stops than about officers who stop and frisk people on the street. Lanier testified at a D.C. Council hearing on the use of stop-and-frisk and other aggressive tactics that some believe disproportionately impact African-Americans. She says an internal audit showed that black men were stopped at a similar rate to the amount that officers were told to look out for a black man as a potential criminal suspect. Lanier says the department stopped and frisked more than 3,000 people last year. Lanier says the department gets more complaints about officers writing excessive tickets during traffic stops. She says she'd like to limit the number of tickets an officer can issue during a stop. At a previous hearing on the subject, Councilmember Tommy Wells said there was "a deep racism" in city police practices. Numerous black residents testified about difficult encounters with police. Wells called the hearing in part because of concern over the shooting of an unarmed black teenager in Ferguson, Missouri. The department has taken steps to address concerns about officer misconduct. This month, Lanier launched a pilot program for body-worn cameras. About 160 officers are now wearing cameras to record their interactions with the public. Police Chief Cathy Lanier said the cameras will "establish a record of police conduct," as well as reduce officer injury and uses of force. Officers turn on the cameras at the beginning of any interaction or call. The camera is expected to remain on during the entire encounter, or until the officer leaves the scene. "This way, we have all the facts," Lanier said.